The Macchi C.200 Saetta (also variously identified as the MC.200) (Italian: Thunderbolt) was a World War II fighter aircraft built by Aeronautica Macchi in Italy, and used in various forms throughout the Regia Aeronautica (Italian Air Force). The MC.200 had excellent manoeuvrability and general flying characteristics left little to be desired. Stability in a high-speed dive was exceptional, but it was underpowered and underarmed for a modern fighter. From the time Italy entered war on 10 June 1940, until the armistice of 8 September 1943, the C. 200 flew more operational sorties than any Italian aircraft. The Saetta ranged over Greece, North Africa, Yugoslavia, across the Mediterranean and Russia (where it obtained an excellent kill to loss ratio of 88 to 15). Its very strong all-metal construction and air-cooled engine made the aircraft ideal for ground attack and several units flew it as a fighter-bomber. Over 1,000 were built by the time the war ended. 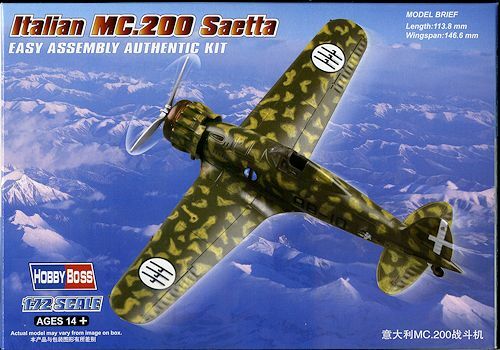 Hobby Boss continues with its easy build kits with this very nice Macchi C.200. 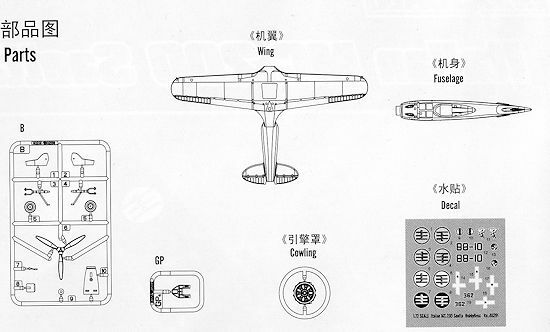 Comprised of but 15 parts, much of the airframe is molded into two main parts; the lower section that includes the wings and horizontal stabs, and the upper section that has the rest of the fuselage and the fin. A basic cockpit of a seat, stick and floor fits atop the lower section before you glue on the upper. No instrument panel is included and for this line of kits, none is really needed. There is a small canopy section that can be added after everything in painted. Landing gear consists of a gear leg, wheel (which fits between the forks) and a door. A one piece cowling includes a fair engine representation as well as the exhaust. One simply attaches the prop with his retainer and sticks it on the nose. That is it. Instructions are well done and provide three construction steps. No painting information is provided for the interior or wheel wells, but these would be Italian Interior Green, a color that is a bit brighter than RAF Interior Green. Markings are for two planes. 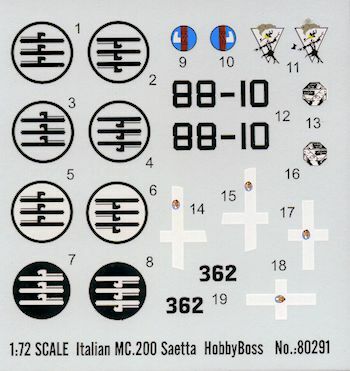 Both are rather complex camouflage schemes with the box art plane being a green lattice over tan with a light grey underside and the second one being a similar scheme with a larger lattice. The second scheme is for the unit that was briefly sent to Russia so it has an all yellow cowling, yellow fuselage band and yellow lower wing tips. Decals are nicely done and should provide no surprises. If you have ever built any of these kits, you know that they are generally quite relaxing and can be assembled quickly. I have found that the large seam between the upper and lower main pieces usually could use some filler and while the detail may not be at the level some would like, these are not produced for the fanatic, but for the casual builder that likes assembling models, but would rather not deal with the fiddly stuff. Thanks to Squadron Products for the preview kit. You can find this one at your favorite hobby shop.